Though much has been written and said about the source of WhistlePig's whiskies and their transparency in their labeling, much has also been written and said about the quality of the product nonetheless. Though generally readily available, the price tag has tended to persuade me against purchasing a bottle. However, this year I used some of my year end bonus to splurge a little and buy a bottle. The nose is primarily burnt sugar along with a soft, malt-like scent, almost like a sugary cereal. It's not a strong nose, but very pleasant and a promising sign of what's to follow. The flavor right away is brown sugar, which quickly fades into a delicious maple pecan and butter flavor. This tasty dessert flavor is accompanied by light crisp apple and citrus undertones that make for an interesting and tasty mix of flavors. It's a very pleasant experience overall, and my first impression is that, although I was drinking this in February and March, it would make a great sipper during warm Summer days. Although it's a 100 proofer, it remains soft and light, and almost refreshing in nature. As I made my way through the bottle, the pecan pie flavor really came forward, and I happen to love pecan pie. It was also paired with a very prevalent anise which added a nice spice to the end. All in all, this is a very tasty and very enjoyable rye, particularly for anyone who doesn't go for those heavy, bold and spicy ryes. This would be right up their alley. 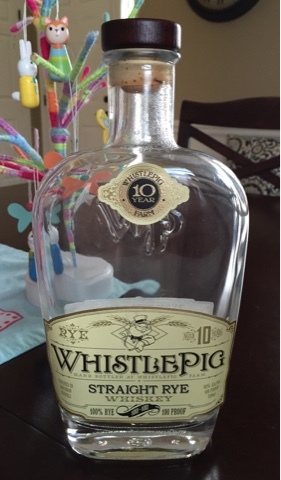 I tend to favor heavier, spicier ryes and, while I enjoyed the WhistlePig 10 year rye, I tend to favor the other end of the rye spectrum. Also, that hefty price tag that made me shy away from purchasing the bottle in the past will likely continue to do so.